Can demography explain Portugal's growth slump before the crash? The above still comes from a recent Financial Times video entitled "Portugal's Brain Drain", which can be found here, and which I encourage everyone to watch. The issue being raised revolves around the current acceleration of emigration from countries on the EU periphery, largely towards the EU core. Typically the emigrants are young educated people who can't find work. There is nothing especially surprising in this, since the tendency has long existed for people to move from more depressed areas to economically more dynamic ones. The exodus from Detroit in the United States immediately comes to mind. Or Scottish people getting on the bus to make the fateful journey from Edinburgh or Glasgow to London. The Schengen accord simply extends this process which used to take place within nation states to single market zones, or currency unions. But does this extension have consequences for the participating states which were not anticipated at the outset, and are these consequences all benign? In addition, this time round in an important sense something is different since these movements are occurring in the context of a long and difficult economic adjustment, indeed one could almost argue that the people leaving form part of that adjustment. What's more it is hard to accept that this is the kind of adjustment that countries like Spain and Portugal really need. Renovation in these countries implies these people and their talent are injected into the local economy to dynamise it, and not shot out the side like water from a high pressure hose with holes in it. So the big question I want to ask here is whether the economic programs which are being implemented in these countries take sufficient account of the demographic impacts they are inducing, and of the fact that the population loss involved - which most likely will become permanent - is going to cast a long shadow over the history of the countries concerned. In earlier generations, migrants used to leave behind them what were comparatively high fertility societies. There were more children being born than the local economy could absorb. We can still see this phenomenon in the world around us, as highlighted by the recent tragedy near Lampedusa, Italy. But the EU periphery case is rather different becuase - as the article I publish below indicates - the countries people are leaving are going to be short of working age population in a not too distant future. Again, as blogger Valter Martins argues, maybe the impact of stagnating working age populations was already being felt before the global crisis broke out. 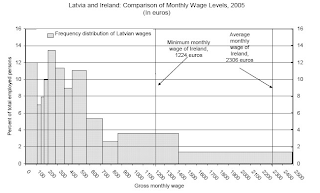 Certainly, as I argue here, a case can be made that in Latvia it was the labour force limitation which lead to the excessive overheating and then the roller coaster landing that hit the country in 2008. True, all these countries are suffering excessive levels of unemployment. But unlike the case of, say, Nigeria or Ecuador, this is not because there are too many young people for the economy to absorb, it is because the economy is stuck in a bad place and can't grow. Structural reforms are needed, but some of the reforms simply don't make sense. What is the point, for example, in lengthening the working life of older, less productive, workers while going to the airport to wave goodbye to their innovative and educated grandchildren who are forced to leave as a result. Surely a better solution would be sustainability in the pensions system - what goes out in total can be no greater than what comes in - and no reduction in the retirement age in the short term. Yes, this will mean lower pensions, but if the young leave the lower pensions will be even lower in the long run. There's a problem of priorities somewhere, and a generational imbalance in how the adjustment is being implemented which is not only unfair, it will lead to far from optimal outcomes in the longer run. 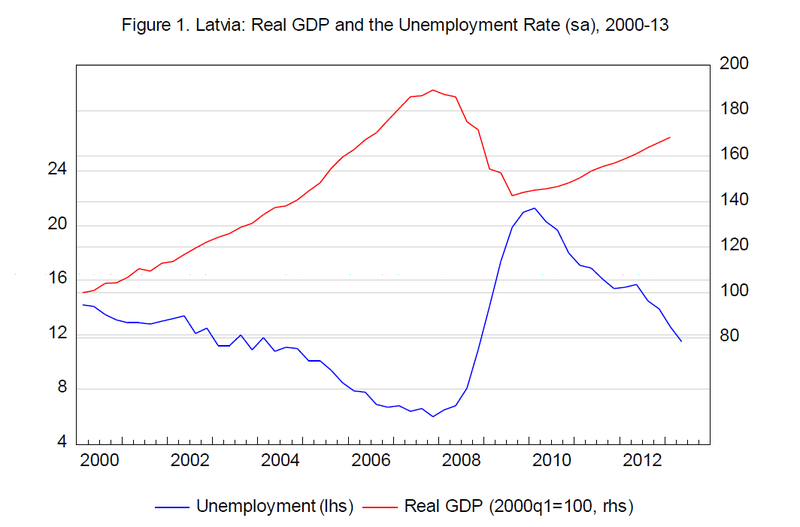 As it happens, just a couple of weeks ago three IMF economists (including chief economist Olivier Blanchard) presented a paper to the Brookings Institute which reviewed the performance of the Latvian economy since the EU-IMF intervention. It was a kind of informal post program evaluation. Interestingly enough, during the course of that paper they raise the very point I am raising here. “The question," they say, "is whether this emigration [from Latvia, EH] is, in some sense, a failure of the adjustment program." This is the typical "non answer" we keep getting to this issue in the EU context. 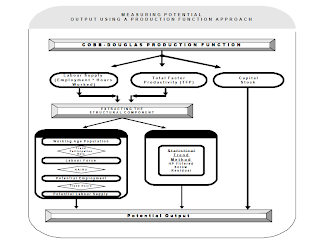 Obviously, from the point of view of optimal output, and the maximizing resources across a continent, most probably such movements are beneficial. But to whom are they beneficial? Which "collective" community is it whose overall welfare is being raised here? Arguably not those in Latvia and Portugal. EU countries are not US states, and a United States of Europe does not exist. Again, this point is obvious, and agreed on by all, but when the problem this raises in terms of emigration from countries who have been running birthrates well below the replacement level is put on the table all we get is silence. Now assuming policymakers are not simply stupid this silence suggests that the whole issue touches on some very fundamental raw nerve. There is no answer in terms of sustainability for those countries who are net losers unless there are reverse direction transfers, as under the US Federal system, and that no one wants to talk about, at least in public. As the IMF economists admit in their paper - “the largely permanent departure of the younger and more educated workers may indeed be costly for those who stay”. So the question they pose - could things be done differently? - remains, at least from the demographic point of view, unanswered. Portugal isn't Latvia, but it does have a very serious demographic problem. 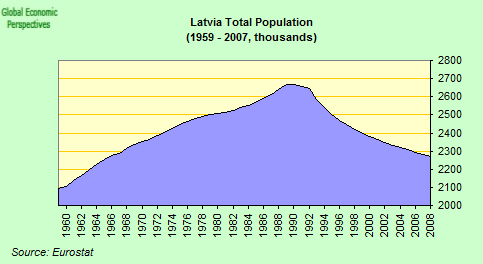 In Latvia the total population declined by about 14 percent (340 thousand people) between 2000 and 2011. Emigration was responsible for about two thirds of this decline while low fertility accounted for the remainder. An estimated 200–215 thousand people left, mainly young people - roughly 9 percent of the population. Obviously Latvian emigration long predates the crisis. 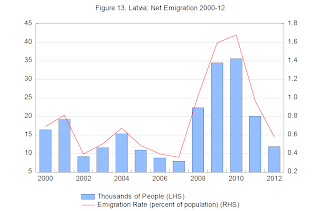 The average net emigration rate was 0.5% from 2000-2007. 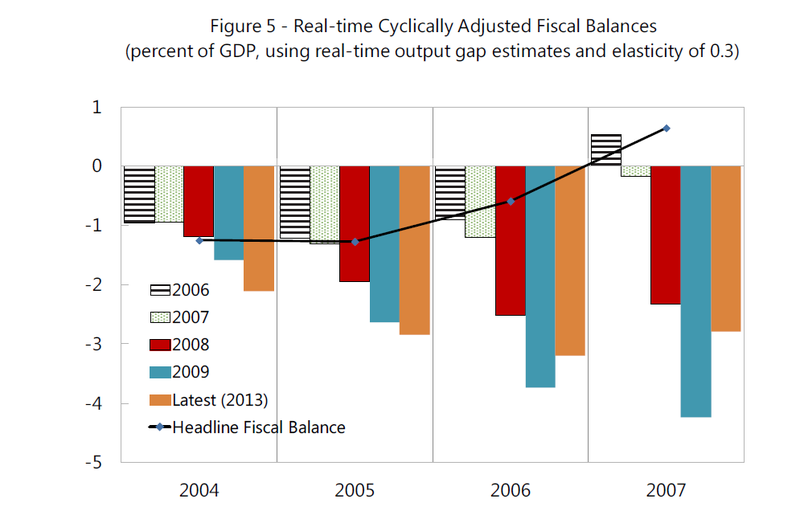 It increased to an average 1.3% from 2008 to 2011, but by 2012, was roughly back to its pre-crisis average. 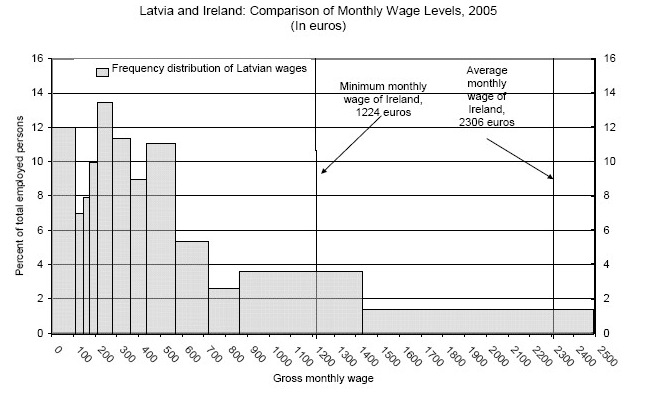 So emigration isn’t a product of the crisis, it was simply made worse by it. But the basic underlying reality is - given the ongoing fertility shortfall - even with the pre-crisis rate of emigration the population pyramid isn't sustainable. Portugal's case is not so severe, but the pattern is similar. Between 1998 and 2008 about 700,000 Portuguese nationals left their home country according to research carried out by the former Economy and Employment Minister Álvaro Santos Pereira. In the pre-crisis years the outpouring was to some extent offset by an inflow of immigrants from other countries, but now the migrants are leaving too so the country's working age and total population are both declining. Which conveniently brings me to the second guest post I would like to present from the Portuguese blogger Valter Martins. As Martin's coherently argues below, the drying up of Portugal's labour supply was already affecting sustainable trend output before the crisis set, so what I am suggesting we might like to ask ourselves is one very simple question - how is an adjustment which accelerates the longer term decline in the country's workforce, and leads some of its younger and abler members to abandon the country, possibly for good, going to help raise the country's long term growth rate? Instead of alleviating this problem it seems to me it is likely to make the long term situation worse. 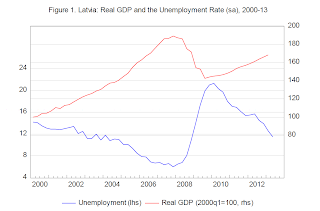 Can demography explain Portugal's slump before the crash? Is the Eurozone suffering from a “Shortage of Japanese”? So what lies behind the relatively low growth that took place in Portugal when compared with other countries that are now in the same situation? To put it another way, what’s the factor that differentiated Portugal from the other countries before the crisis of 2007-08? A number of recent papers and articles have attempted to explain the causes of this relative weak performance, but although some of the factors mentioned surely contributed to the weak Portuguese growth they do not fully explain it since many of them were also present in the other - higher growth - countries before the crisis. So we need to look a bit deeper. Essentially, long term economic growth can be split into labor force growth and productivity growth. Invariably, the main cause cited for the Portuguese low growth has been productivity growth, or the lack of it, but although this certainly has been a problem in the last decade, it was not so much of a problem before, and it hardly appears sufficient on its own to explain the relative weak performance. The differences in productivity gains don't seem large enough to justify the sizable difference in GDP growth, even in the cases of Ireland and Greece (where productivity growth was higher than Portugal), and certainly not vis a vis Spain since productivity growth there was lower than Portugal, as can be seen in the chart below. In the last decade, productivity growth in Portugal was threefold that of Spain but its growth was less than half. As such, we can safely conclude, that productivity on its own cannot explain the differences in economic growth between Portugal and the other group of countries. On the other hand, the stagnation and decline of the working-age population can not only help explain the weak economic growth that afflicted Portugal, but also the GDP growth differences between several countries in the Eurozone before the crises. As explained in the previous post, between 2003 and 2008, working-age population growth in Portugal was negligible and as such the “workforce effect” - contribution of labor force growth to GDP growth - was non-existent, as can be seen in the chart above. Starting in 2008, working-age population growth became negative and thus the “workforce effect” began to act as a drag on the economy. To maintain a strong rate of economic growth Portugal needed to gradually increase its productivity growth, and/or alternatively increase its labor participation rates - to compensate for the declining workforce - but given that this is not easily attainable trend growth will surely steadily fall. Therefore, when the labor force starts to stagnate or decline it is likely that economic growth begins to stall. This phenomenon may well explain the relatively weak economic growth seen in a number of European countries over the last decade. In particular, it explains why Portugal and Spain had very different economic performances before the 2007-08 financial crises and how the two began to converge subsequently. Population change is comprised of natural growth, the difference between births and deaths, and net migration, the difference between immigration and emigration. Natural growth, both for Portugal and Spain, had been barely edging positive at the turn of the century since in both countries the total fertility rate fell below replacement level in the early 80’s. In Portugal, natural growth turned negative in 2007, the year that for the first time there were more deaths than births. 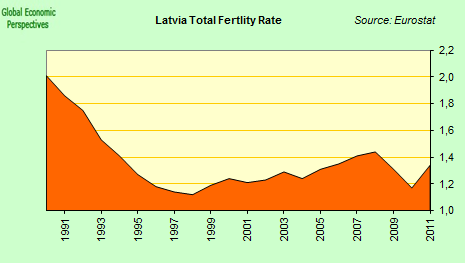 On the contrary, Spain experienced a slight recover of its natural growth in recent years, as a result of an increase in its total fertility rate, as can be seen in the chart below, although this is due almost exclusively to foreigners, who have a higher fertility rate than the native-born. As a result, both in Portugal and Spain, population growth in the last decades depended almost exclusively on having a positive net migration, and this resulted in a large influx of immigrants. But while in Portugal this growth started to slow down beginning in 2002, in Spain immigration exploded until the boom burst in 2007, as can be seen in the chart below. "No modern country on Earth experienced such a massive increase in its immigrant population as Spain. In 1990, one in 50 people in Spain was an immigrant. Today, it's one in seven." With the accession to the European Monetary System and later the Euro, interest rates declined significantly for both Portugal and Spain and as a result the two increased their debt levels. According to the McKinsey report, Debt and deleveraging (see page 14), in the second quarter of 2011 Portugal and Spain had total debt of 356 and 363 (as % of GDP), respectively. The consequence of cheap and easy credit was to create a housing bubble, both in Portugal and in Spain, but while the Portuguese began to deflate in 2002, the Spanish continued to inflate until 2008. This outcome was the result of the substantial increase in Spain’s population as a result of immigration, many of them Portuguese, while the increase in immigration in Portugal was just enough to replace the ones who were leaving. This population growth allowed the housing bubble to continue for much longer in Spain, while in Portugal there were no longer enough people to buy the excess homes being built, and so prices didn't skyrocket; but the housing units were built regardless. As such, rather than a classical bubble with inflated house prices, in Portugal, it was more a case of oversupply, given that 800,000 homes were built in the last decade while the population only grew by 200,000. On the contrary, in Spain, in addition to the excess construction, prices went through the roof, with migration pressures making a substantial contribution to both. It is estimated that the immigration inflow increased house prices by about 52% and was responsible for 37% of the total construction of new housing units between 1998 and 2008. Between 2002 and the 2007-08 financial crises the growth of the Portuguese economy started to fall more in line with the growth of economies where the labor force was stagnant or declining, namely Italy and Germany, as can be seen in the chart below. 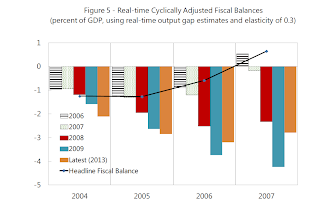 However, the dynamics changed completely with the onset of the 2007-08 recession. In Spain, where working-age population growth depended exclusively on immigration, the rates of labor growth collapsed, only matched by the plunge of its GDP growth, and its workforce has actually started to shrink. In Ireland, despite a more abrupt fall, growth nonetheless remained positive, this was due to the fact that its population growth did not depend only on net migration but had an important natural component as well. In fact, Ireland has the highest fertility rate amongst European countries and therefore, unless emigration returns to numbers only seen in previous centuries, growth of its working-age population should stabilize in positive territory, although at a level well below the pre-crisis one. In Portugal and Greece, even before the 2007-08 recession, labor force growth already showed clear signs of a slowdown, as growth came to a standstill in 2005, and despite a slight recovery after, more pronounced in Greece than Portugal, working-age population went into decline with the onset of the recession. Italy, which had reversed the decline of its working-age population initiated in the 90’s, appears to have once again slid back into negative territory. On the other hand, in Germany, the workforce began to grow for the first time since 1998 due to an increase in immigration, many of them Portuguese, Spanish, Italian and Greek. As explained by Daniel Gros, when comparing economic growth performance between countries with very different rates of population growth, the best indicator is undoubtedly GDP per Working Age Person (GDP/WAP). Hence, if we compare the per working-age person GDP growth between the various countries in the last decade, as such taking working-age population growth out of the equation, it can be said that growth in Spain and Ireland was not so spectacular as it looked on paper, nor was growth in Portugal, Germany and Italy so dire when taken in comparison. In fact, only Greece seems to have had a spectacular growth, which would be in line with its productivity growth before the recession, but Greece’s population statistics might be underestimated, as Greece has not only a large population of illegal immigrants but some weakness in data collection that have also been highlighted. Anyway, a part of Greek growth was probably due to other - unrepeatable - factors, like the Olympic Games. It also should be highlighted the economic growth which was achieved in Germany despite the decline of its workforce, proving that growth is possible with a declining population. Despite some regional variation as a result of internal migration, the reality is that working-age population in the Eurozone as a whole has now initiated a long downward trend that will have major repercussions in terms of its economic growth, as explained in the previous post, and therefore, we can also conclude that Europe is starting to suffer from a "shortage of Japanese" as shown in the graph below. As such we cannot fully comprehend the situation that Portugal, Spain and Greece face at the moment without looking into their adverse demographics. This already exerted an disproportional role in the last decade, namely in Spain, whose migration-induced working-age population growth goes a long way explaining its outstanding economic growth, while for Portugal the contrary it’s true, as the lack of population growth made its economy lose steam as it joined the Euro. More worryingly tough, is that working-age population in Europe as a whole has started a long, perhaps irreversible, path of decline that will act as a drag on its economic growth, making the economic recovery for these countries even more difficult. Is The Perfect Always And Everywhere The Enemy Of The Good? Against a backdrop which offers an eerie parallel with events which took place somewhat to the North more than 30 years ago, Catalonia is now threatening to separate from Spain. In so doing the region seems to be putting at risk both the future of the host country and beyond that the outlook for the Euro currency and the process of European unification. The parallel is of course with the drive for Baltic independence and its impact on Mikhail Gorbachev’s ill-fated attempt to peacefully reform the disintegrating Soviet Union. In the words of Aleksandr Yakovlev, one of his closest associates at the time, the ideas of those seeking independence were ''out of touch with reality'' and any expectation that the Baltic republics could regain the independent status they had before Soviet annexation in 1940 was ''simply unrealistic.'' As late as February 1991 Gorbachov himself was still describing the Lithuanian vote – described by the countries leaders as simply a non-binding opinion poll - as illegal, and this a matter of days before it was actually held. Sound familiar? It should do, since these very same arguments are now being played out in another pole of Europe. Not only is the Spanish administration taking precisely the view that any vote in Catalonia on whether or not to separate from Spain would be illegal, the attitudes of those outside the country are largely being conditioned, not by the merits or otherwise of the Catalan case, but by the fear of what might happen to Spain if Catalonia left. While Catalans busy themselves assuring each other that any new state would be economically viable, few on the outside doubt that this would be the case. To give but one example, former chief economist at the IMF Kenneth Rogoff recently commented that Catalonia taken on its own constitutes one of the richest regions in Europe. This is simply stating the obvious. 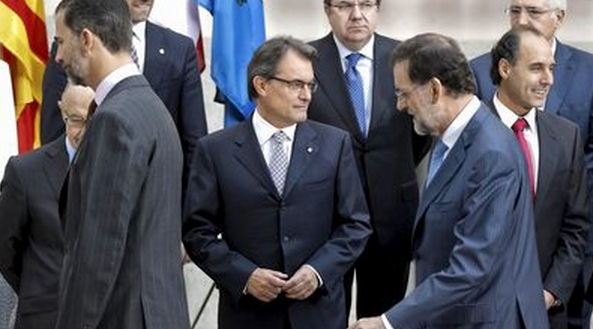 What has external observers really worried is the subsequent viability of Spain, and with it the future of the Euro. If Spain is too big to be allowed to fail, then Catalonia is too small to have inalienable rights the argument seems to run. It is for this reason, I feel, that the Catalan cause is attracting little sympathy beyond the confines of what is often called “The Principate”. Many feel that Catalonia is being selfish – just as they felt in their day that the citizens of the Baltics were - in putting their own particularist interests (a better fiscal distribution, the right to a national football team) before those of the collective (economic recovery, closer political union in Europe, etc.). 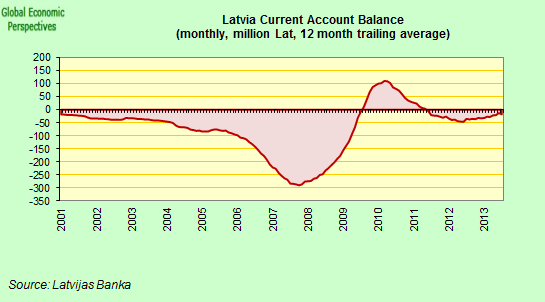 But this way of looking at things is essentially flawed, just as it was in Estonia, Latvia and Lithuania. 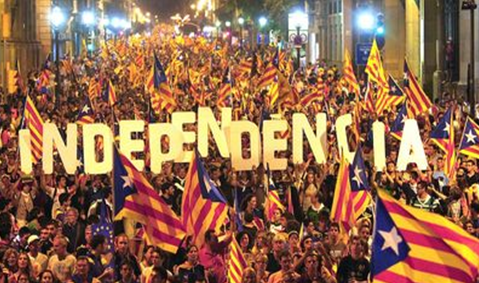 The movement for Catalan independence is primarily, and at its core, a democratic one. So what should matter to the outside world is not whether the vote will be considered legal by the central government in Madrid, or whether the Catalans have a good case. If the Catalans vote peacefully and democratically, and by a significant majority, that they want to form a separate state, then it is clear that the region's days inside the frontiers of the Kingdom of Spain are numbered. Unless that is the Catalans be retained within those frontiers by the use of force, in which case some of the fundamental principles of the Treaty of Europe will be put in question. Hence the fundamental dilemma which the Catalan independence drive presents to the whole European Union. Under these circumstances what outside observers should focus on is what the result of the vote, when it does finally take place, will be. After all what the Catalans are demanding at the moment is “the right to decide”, and at the end of the day it is they who will decide. My country, as the saying goes, right or wrong. Nothing here is either unavoidable or inevitable. As in the case of Greek Euro exit, beyond the expedient there are no ex ante juridical limits to the bounds of the possible. What is important for everyone is that the eventual solution be an orderly one. In this context messages that the new country, should one be created, would need to apply for membership of the European Union constitute nothing more than mere hot air, just as the suggestions from the Spanish administration that any such application would be met with a veto on their part is no more than an empty threat. Such talk is not in the realm of the real, or the realistic. It is simply an attempt to alter the outcome of the vote, and a bad and ineffective one at that. Not for nothing does Catalonia’s President Mas describe the speechwriters of the Partido Popular as running a production line for manufacturing separatists. If Spain’s sovereign debt is already on an unsustainable path, then how much less sustainable would it become if the country suddenly had its GDP reduced by 20%? Common sense dictates that negotiations would be held, negotiations in which Catalonia would be asked to accept a proportion of the legacy debt, just as common sense suggests that Catalonia’s financial system, which has assets of around 500 billion Euros (i.e. 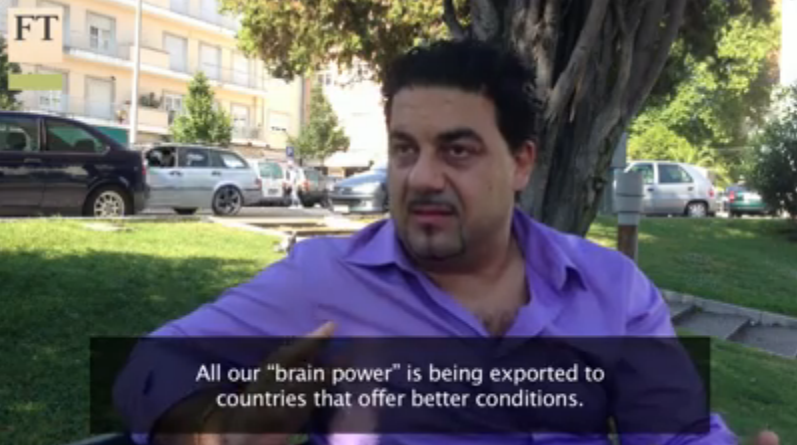 it is much larger than the Greek equivalent) would be allowed to remain in the Eurosystem. The alternatives – and their consequences well beyond the frontiers of Europe – are simply unthinkable. Naturally sometimes the unthinkable happens, especially when a majority of the key players assume it won’t. 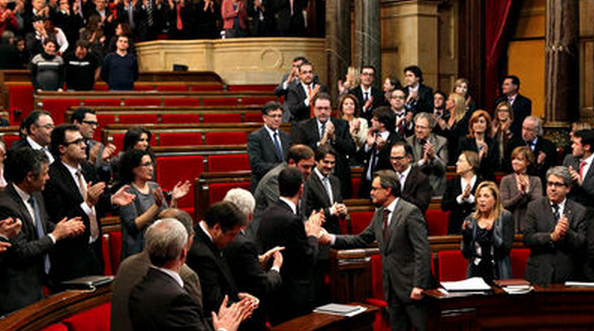 Catalonia has now decided to hold some sort of “consultation” or “opinion poll” during 2014. As in the Lithuanian case the outcome may not be binding, but few should draw comfort from that single fact and assume that the result will not be significant and even decisive for the short term future of Europe. As I say, nothing here is inevitable, or foretold in advance. But avoiding predestination involves facing up to the facts, and not, as the IMF director general Christine Lagarde recently put it in the Greek context, engaging in wishful thinking. And the facts in this case are that dialogue between Catalonia and the rest of Spain has now broken down. Catalans feel themselves to be tired of not being listened to, while the rest of Spain feels itself tired of the Catalans and their constant demands for more autonomy. At one pole there is “Spain weariness” and at the other “Catalonia exhaustion”. Matters have now past the point where orderly solutions will be sought out and found internally. Most external observers expected some sort of offer to be made by the central government after the last Catalan elections, but reading the result as a setback and defeat for President Mas the only “offer” which has been sent in the direction of Barcelona is one which involves “Hispanicising” children via the reform of the Catalan education system, a move which has effectively united the Catalans behind their new government. That is why a decisive intervention on the part of Europe’s political leaders is now crucial. Whether they like it or not they have no alternative but to become intermediaries in the search for viable solutions, if not neglect will only produce the result everyone seeks to avoid. It is no accident that the Baltics saw their chance just in the moment of maximum Russian weakness, and that Catalans see their only realistic possibility of achieving their objective of having their own state just when Spain is effectively on the ropes, and possibly in terminal decline. Some, comforted perhaps by the writings of Francis Fukuyama, feel that what is happening to Spain is simply an unfortunate setback on the bumpy road to becoming a mature democracy, but darker readings are possible. The current economic crisis is not simply cyclical or conjunctural and there is a real possibility that the country’s problems are so complex that it will become impossible for Spain’s leaders to fix them without recourse to an Argentina style default. It is precisely the loss of confidence in the capacity of the Spanish political class to resolve the country’s dire economic situation, and the mounting frustration with their perpetual insistence that all will be well starting tomorrow that has the Catalans running for the exit door. If the building is about to burn down they don’t want to be trapped inside when it happens. As Janice Joplin once put it freedom is sometimes “just another word for having nothing left to lose”. In the critical weeks and months that are to come, I think it important that all participants bear in mind that once the Baltic vote was taken, and once the demise of Gorbatchev became inevitable, attitudes towards the new countries rapidly changed. All three are now consolidated members of the European Union, and the past is simply that, what is over. Many Catalans tell me they are doing what they are doing, not for themselves but for their children and their grandchildren. Measured on such a timescale a few years of economic turbulence seem as nothing. In the interest of the common good solutions need to be found - solutions which are able to both satisfy the aspirations of the Catalans and guarantee stability in Europe. If this search is not initiated soon, then time will ineluctably run out and the likely will steadily become the inevitable, simple application of the rules of game theory tell us that. There isn’t a day to lose. You know it makes sense. The above is a short chapter I wrote for the book "What's Up With Catalonia" published earlier this year by the Catalan Press. 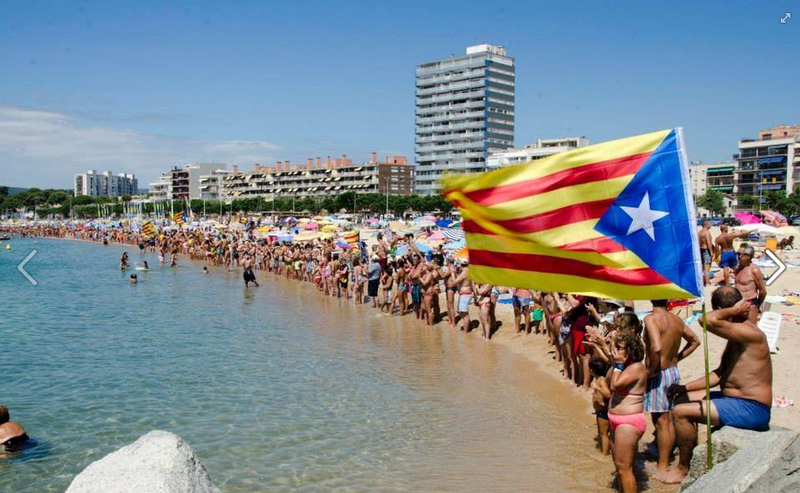 Why are Catalans taking part in a human chain this Wednesday? The Catalan newspaper Ara has produced a series of questions and answers in English which should explain everything you want to know about why the human chain is taking place today. What is the 'Via Catalana'? The 'Via Catalana' (The Catalan Way) is a political demonstration which will take place this September the 11th. Inspired by the Baltic Way — a human chain formed by up to two million people on August 23 1989 across Estonia, Latvia and Lithuania — its aim is to create a 400 km long chain which will cross Catalonia from north to south. 400.000 people have signed up to take part in the human chain, although organizers hope that the actual turnout will be at least twice that figure. People will be asked to join hands at exactly 17:14 (15:14 GMT). The chain, which runs along highways, roads and city streets, will come to an end at 18:00 (16:00 GMT). If successful, it will be one of Europe's largest ever demonstrations, following in the footsteps of last year's march in Barcelona, when up to 1,5 million people walked through the streets of the capital asking for independence, the country's most massive rally ever. With more than 7,2 million inhabitants Catalonia is a country in the northeastern corner of the Iberian Peninsula. At a crossroads between different cultures and civilisations, it once formed part of the old Crown of Aragon, which merged with the Crown of Castile to create what later became Spain. What in medieval times was a powerful nation which extended its influence across and beyond the Mediterranean, is now an autonomous region within the Spanish State posessing restricted powers, devolved as seen fit by the central state. It has its own language, Catalan, and institutions, amongst them one of Europe's oldest Governments and Parliaments. Why is the Catalan Way taking place today? Catalonia was a party in the War of Spanish Succession (1701-1714), where the old crowns of Castile and Aragon fought, alongside their European allies, over who should be crowned as king of Spain following the death of Charles II. Catalonia, which favoured archduke Charles as successor, lost a war which ended with Europe recognising Philip V as the new king of Spain. The long war ended with a prolonged siege of Barcelona, Catalonia's capital, which was systematically bombarded by Spanish troops fighting for the Bourbon candidate, Philip V. After months of resistance Barcelona finally surrendered on September 11 1714. Modern Spain was born, but Catalonia was to pay a heavy price for its support for the Austrian candidate: Catalan language was forbidden and Catalan institutions abolished. Every year, on September 11, Catalans commemorate the day on which Barcelona fell, honouring those killed defending the country's laws and institutions [See video: A trip to Barcelona]. Why do many 21st century Catalans want independence? Since the defeat of 1714 Catalonia has never been allowed to rule itself again [a Catalan history of Spain]. The old nation was forcefully transformed into a mere Spanish province. This state of affairs did not change until 1931, when the proclamation of the Spanish Republic gave Catalans the freedom to regain their old institutions. Catalan was taught in schools, the Parliament reopened, the Government was once more established... Unfortunately the situation was not to last. The end of the Civil War, with the subsequent establishment of the Franco dictatorship, meant a new blow for the country, crushed once again by a centralist state, administered directly from Madrid. Following Franco's death, and with a new democratic regime in place, Catalonia regained its old institutions, and it was once more allowed to rule its own affairs in a number of key areas. But the centralist inertia of the Spanish state, always resisting to the last all devolved powers and continually meddling in matters which are close to the heart of all Catalans — like respect for the Catalan language — has left Catalonia’s citizens with a deep sense of frustration. This frustration was brought to a head in 2010 when an appeal by the Partido Popular over some of the clauses in the newly approved Catalan Statute (which won majority votes in both the Catalan and Spanish Parliaments) lead the Spanish Constitutional Tribunal to rule it was unconstitutional to use the term “nation” to refer to Catalonia in the document’s preamble. Since that time the feeling of alienation from Spain has only grown, with many previously apathetic citizens suddenly becoming separatists. More fuel has been added by the economic crisis, and the gross incompetence which has been demonstrated by Spain’s political and financial leaders. This, along with the record levels of unemployment with no end in sight, has given a new impulse to Catalonia's demands, since it has left the Catalan Government in a critical financial situation, unable to access the international financial markets and totally dependent on the such funds as the Spanish Government to forward to it. This unjust situation reached its most bizarre moment when the Spanish government raised the VAT rate last year to help improve funding. The Catalan government actually lost out, since it had to pay the new rate to all its suppliers but received no refund or additional funding from the central government which was, of course, much better off. 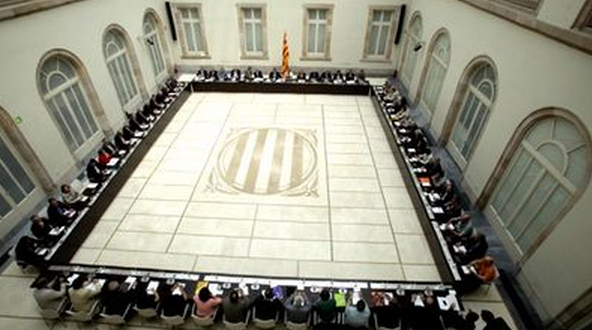 What do the Catalan political parties say? Since the death of Franco all Catalonia's main parties have argued for a theoretical right to self-determination, but have never taken steps towards achieving that goal. Following slow and painstaking negotiations with Madrid, only a fragile, unstable compromise has been reached: the Spanish state has devolved powers in some key areas, from education to health or police, but it still is unable to recognise Catalonia as a nation. This has left Catalan parties divided on the issue of which course of action to take. Traditionally, Catalan parties have asked for more powers to be devolved from Madrid to Catalonia, but the recent rise in strength of the pro-independence movement — which originates in social, rather than political organizations — has taken some aback [See video: Catalonia push for economic independence]. Centre Right Nationalist CiU, Catalonia's current governing political coalition, has evolved from a pro-autonomy stance to being more clearly inclined towards independence. It is, though, a coalition of parties with different views; officially, it wants a referendum on independence, but stresses the need to reach agreement on this with the Spanish Government. The once powerful Socialist party PSC, which has strong ties with the Spanish Socialist PSOE, is torn too between conflicting approaches. In theory, it recognizes Catalans the right to self-determination, but rather than asking for independence, it wants Spain to move towards a more federal political structure. The left republicans ERC, for years the only party actively seeking independence, are the rising star in the current Parliament and, according to some surveys, could become the country's main party if elections were to take place now; they want to hold a referendum as early as 2014. Left-wing ICV, political successors of the old communist party, support the idea of a referendum, although their views on independence are not so clear. Finally, the Popular Party, which is now in power and Spain, and Ciutadans, are both opposed not only to independence but even to an eventual referendum on the issue. However, they are a minority in the Catalan political landscape: the Catalan Parliament has passed a declaration which states that Catalonia is a country with the right to decide its own future. The declaration was passed with 104 votes in favour of a referendum, for only 27 against [See video: Will Catalonia say adios to Spain?]. The Spanish Government bitterly opposes the organization of a referendum in which Catalans can choose whether they are in favour or against an independent Catalonia. The official position is that the government has to abide by the Spanish Constitution, which states that there is only one nation, the Spanish one, and that sovereignty is exclusively held by the Spanish people in its entirety; this means that what is seen as being simply one part of the Spanish nation cannot on its own decide on matters which affect all, effectively denying the principle of the right of peoples to self determination. Since, according to the Constitution, only the Spanish Government can organize a referendum, the Catalan demand faces an insurmountable barrier. Spanish main parties — PP, now in power, and the socialists, the main party in opposition — do not want Catalans to express their views on a referendum [See video: Should Catalonia seek independence?]. What is the position of the EU? The official position of the EU is that it is not for the institution to take into consideration hypothetical declarations of independence following the possible breakaway of part of an existing member state. The official line of the EU Commission is that Catalonia's independence demand is a Spanish internal affair and, as such, they cannot comment on the issue. This has proved to be a controversial idea, though, since the Spanish Government has tried to influence the debate by assuring that an independent Catalonia would be automatically expelled from the EU, and should start from scratch new negotiations with Brussels to rejoin the institution. Some commissioners have denied this, stating that there is no precedent for a situation like this, and that Europe could not possibly deny membership to 7,2 million people who are now EU's citizens. Why is Scotland holding a referendum, while Catalonia is not? What is Catalonia's level of autonomy? Catalonia has a restricted autonomy. The Catalan Parliament has the power to pass laws on all sort of issues, from education to housing, but this theoretical autonomy has many strings attached. To begin with, the Spanish Government is unwilling to hand over some key powers, from allocating student grants to administering pensions, and tries to legislate on areas of devolved power, a situation which leads to constant conflicts between the governments in Barcelona and Madrid, with the Spanish Constitutional Court deciding which of the two is entitled to legislate the disputed area. Crucially, all main taxes are collected by the Spanish Government, which is then responsible for distributing the money raised between the various receiving institutions. In practice, Catalonia's Parliament is legislating on affairs without having the money to implement its laws. How strong is the popular support for independence? Surveys vary significantly, but they show two consistent trends. First, support for independence has been growing year after year. Second, from being the option favoured by a minority of Catalonia's citizens, independence is now supported by the majority of the population. The latest official figures show that, in an eventual referendum, 55,6% of Catalans would vote in favour of an independent state, with those against being 23,4% and roughly a 20% showing no clear preference or saying that they are not interested. When asked which form of relationship with Spain do they prefer, 47% favour an independent state, 22% want to maintain the current status quo, and 21% would like Spain to become a federal state. A Council for the National Transition, with academics and experts from a number different fields, is working on the establishment of a timeline for an eventual referendum. Catalonia's main political force, CiU, which governs thanks to the support in Parliament of pro-independent ERC, argues that a referendum should take place before the end of 2014. The problem is that, according to the Spanish Constitution, only the Spanish Government can authorize the referendum, something the ruling PP party is firmly opposing. Other options include organizing a referendum without Spanish Government consent — which would make it technically illegal — or dissolving the Catalan Parliament and organizing new elections, with pro-independent parties sharing part of their manifestos. After months of bitter disputes, the Catalan president, Artur Mas [profile], is holding discrete talks with his Spanish counterpart, Mariano Rajoy, to try to find a way out of the current deadlock. Could an independent Catalonia become a viable state? As with all the other aspects of the argument, the viability of a future state is a contested issue. Those opposing independence argue that a Catalan state would inherit a huge deficit which would make it very difficult to pay pensions or salaries. Besides, they take for granted that Catalonia would be expelled from the European Union, depriving Catalan companies from the benefits of a single market. On the other side of the debate, those in favour of independence argue that, without the burden of the huge deficit which results from the difference between what Catalans pay in taxes to Spain, and what they get in return, Catalonia — Spain's most vibrant economy — would have a GDP level in line with some of Europe's wealthiest nations, and its government could reduce the current debt and improve the quality of public services. In addition they doubt that Catalonia would find itself outside the frontiers of the EU, pointing among other precedents to the fact that the EU Treaty held that national bailouts of member states were illegal, until in fact one was urgently needed. [Keys on the independence of Catalonia].